Welcome to our website - AISLINGCUDO IRISH RED AND WHITE SETTERS. We hope that you enjoy viewing the pictures of the many Aislingcudo dogs. We haste to acknowledge the dedication and hard work that Aislingcudo puppy owners put into supporting and developing the breed. Many of the brags and pictures on the photo pages reflect the time and energy that they personally have put into their dogs. A special thank you to the Aislingcudo family! Aislingcudo Gang - 13 years later! Our kennel name, Aislingcudo, literally means in the vision of Cuddy and Doherty. 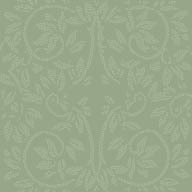 From the Gaelic - the translation of aisling is vision or dream. A vision is of course something one aspires to – it is a goal - it is something that one always seeks to attain - the journey is ongoing “miles to go before we sleep”. Maureen Cuddy and Canon Patrick Doherty (heirs to Noble Huston’s great heritage) worked tirelessly for decades circa the 1970s. Both are now over the “Rainbow Bridge” but their vision lives on in all those who continue to promote the breed worldwide. Síochán – ar dheis lámh Dhé an dís acu. 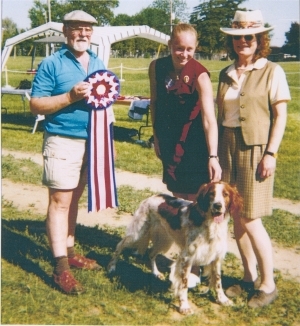 Our adventure with Irish Red and White Setters began in 1993 with our eight week old Red and White Bran (Can CH Caniscaeli Two is Bran Dil) from the first CKC registered litter in Canada. 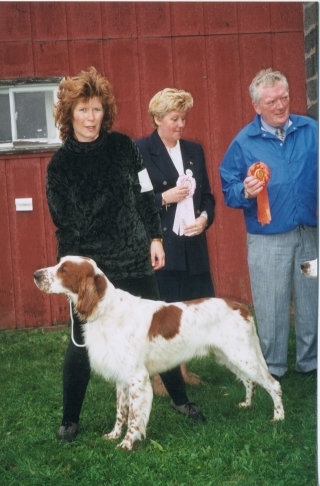 The Irish Red and White Setter was not a recognized breed in Canada in 1993 but with love, enterprise and devoted energy, in January of 2000, the breed acquired full recognition with the Canadian Kennel Club. By then Bran had done well in the rare breed rings and won numerous Best In Show ribbons. Also by 2000 we had imported Una (Sheebhin Snowdrop), Aine (Bobbie’s Girl) and Lonan from Ireland. We had kept Pingin (Can CH Aislingcudo Is Pingin Ruadh) from one of our first litters. Pingin, like Aine her ‘mom’ and Bran her ‘dad’ could also boast of winning Best In Show in the rare breed rings. If you go to ‘OUR PAST’ on this site you can view our foundation dogs with some of their accomplishments noted. There, also, you can read their memorials, which have become a poignant part of the historic beginnings of the Irish Red and White Setter in Canada. Albrecht and I had the pleasure of meeting and visiting with Mrs. Cuddy (Knockalla) on our many return visits to Albrecht’s homeland, Ireland. During those visits she would often share historical lore on how the breed evolved in Ireland. Without her dedication and knowledge of genetics the breed might well have become extinct. The breed, though still rare and few in number, is recognized and endorsed in National Kennel Clubs worldwide. On those same visits to Ireland we spent many hours visiting with Canon Doherty (Sheebhin) and Maureen Daly his superb assistant and other key individuals in the revival, good friends of Mrs. Cuddy. The ‘story’ is that the Canon went into the Kerry Mountains looking for Irish Setters with Irish Red and White in their genetics, dogs used as foundation to revive the breed in Ireland. 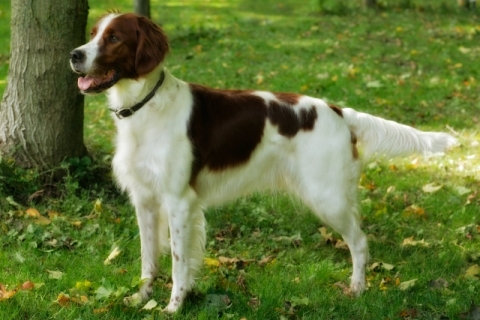 It was on a dog bred by Mrs. Cuddy, Harlequin of Knockalla, owned by Ann and Allan Gormley (Meudon), that the corner stone of the revival of the Irish Red and White Setter rests. 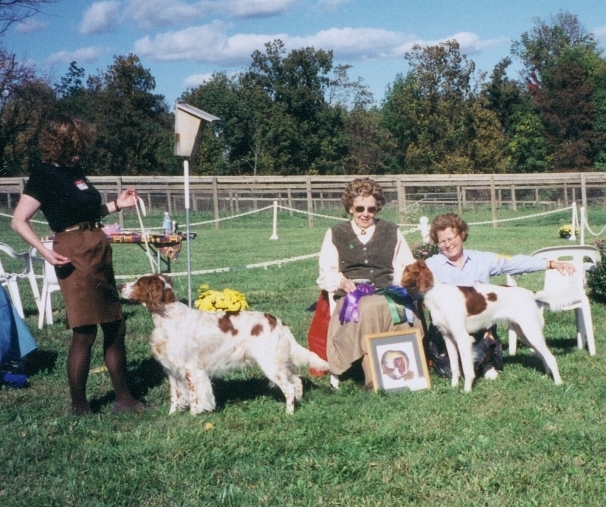 Glenkeen Sandy (Doherty - Sheebhin) and Gay of Knockalla (Cuddy ex Gaynor) initiated a future extolled by a growing web of Irish Red and White Setter amants. 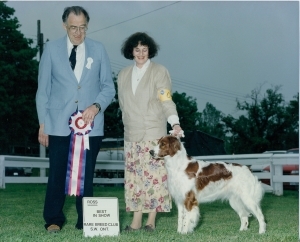 We had the cherished opportunity of showing Bran to Ann and Allan Gormley (Meudon) when they judged at a US Irish Red and White Setter Specialty in mid 1995 prior to AKC breed recognition. In North America we have also shown to Muriel Iles (Glennessa), Pat Brigden (Autumnwood), Tom Cramer (Past President of the Irish Kennel Club), Jackie Bayne (Corranroo), Eileen Walker (Wroxham), Jackie Howatson (Vanders), Ann Millington (Coppermoor), Mary Sherratt (Charnborough) and to a host of renowned North American judges including the late lamented beloved Anne Rogers Clark. We have visited England many times, attended Crufts and visited with breeders who were involved when the breed was first introduced to the United Kingdom where the breed flourishes. 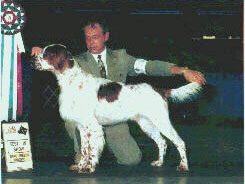 In 2011 Aislingcudo Irish Red and White Setters was granted Permanent Registration status by the Canadian Kennel Club. In order to receive this, a breeder must have maintained their CKC membership for a minimum of ten years; have bred purebred dogs for a minimum of ten years; have been in good standing with the CKC and have owned and/or bred not less than five dogs to which the CKC has granted a title. We have bred at least a score and a half and are blessed to have formed a coterie of good friends in so doing. 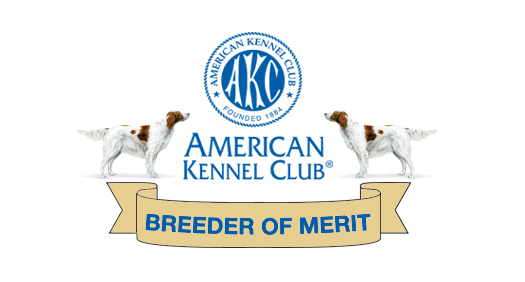 In the spring of 2011 we were given the title of ‘Breeders of Merit’ with the American Kennel Club. 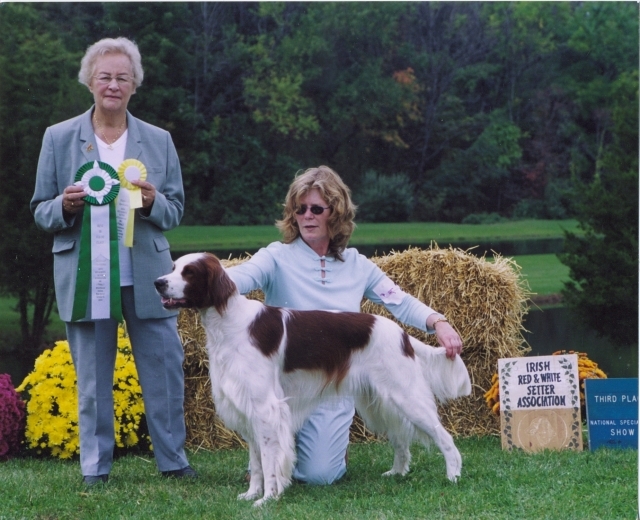 We live with our Irish Red and White Setters on five sprawling acres in a quiet country setting in Southwestern Ontario, Canada. Our home is located in Wilmot Township, a hour and a half from Toronto and sixty minutes from London. 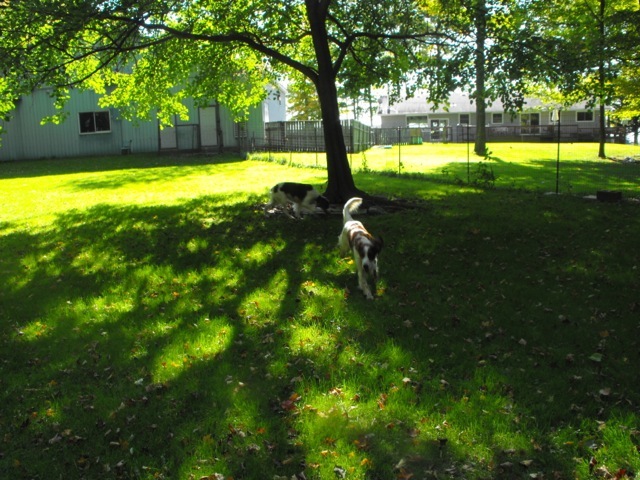 Some three acres (two green fields) are totally fenced for the dogs where they spend a good part of their day running and playing and attempting to catch that elusive leaf and butterfly. 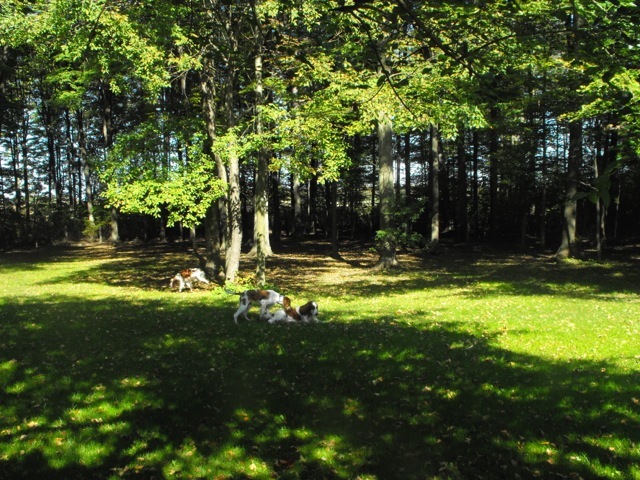 Also, on the property we a have a large indoor facility where the dogs are taught agility, obedience and conformation. There is also a grooming facility and kennel area, the latter (rarely employed) as the dogs much prefer the comfort of the house and human laps! 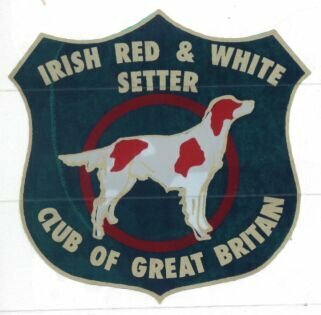 Please feel free to contact us with any questions that you may have about Irish Red and Whites Setters and / or our breeding program.